While not quite reaching the heights of Brioni or Kiton, these four brands all make very well constructed suits and have individual devotees. One thing that I have always felt stands out about Pal Zileri, though, is the design. Last year I remember browsing the Pal Zileri store on Bond Street and becoming fascinated with an unlined, unconstructed cashmere overcoat. Navy on the outside, orange check on the inside. It seemed so unlike anything I had seen in any comparable brand. Needless to say, when I came to researching this piece last week, the overcoat had sold out, the last few pieces snapped up in the sale. Yet there was still no lack of design quirks on display. Not all unique to Pal Zileri, perhaps, but symptomatic of the psychology behind the brand. 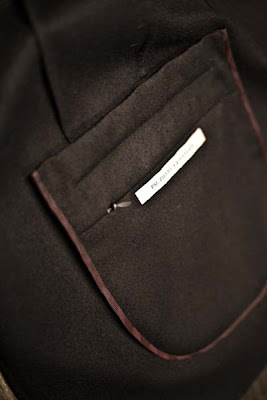 One unlined blazer I looked at, for example, had a very neat little floating pocket sewn to the inside hip (above). While not necessarily innovative, it was very fitted and sharp where those of other brands can seem like rather an afterthought. That same blazer also purposefully left its internal seams open along the sides of the jacket and under the shoulders, so you could see the horsehair-and-cotton lining and delicate shoulder pads (above). Also, mother-of-pearl buttons on black cashmere. I also like the fact that the trouser cuffs in the Sartoriale range all have buttons that attach them to the trouser leg, so you can let them down when they’re being cleaned (below). And the buttons are identical to those on the front of the jacket, only smaller. 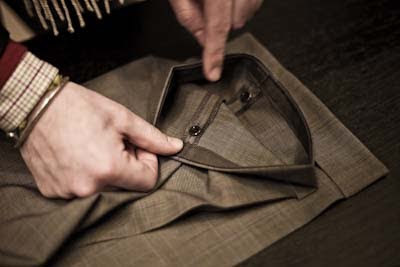 The internal chest pockets also extend above the opening as well as below, to help hold cheque books or particularly long wallets without making the pocket too deep (below). And there’s standard details like coin pockets and split waistbands. 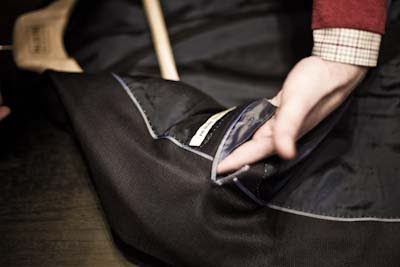 Around 70% of the Sartoriale jackets are handsewn, with a particular focus on sleeves, buttonholes and linings. 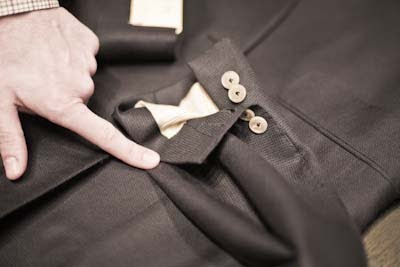 There’s always a handsewn loop behind the lapel to secure one’s boutonniere as well. 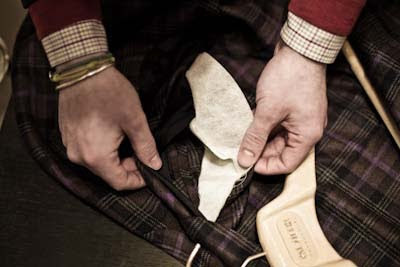 The cloth is always cut by machine, though, and the next option up is made-to-measure rather than bespoke. Pal Zileri is a relative newcomer to the UK, but one with a growing fanbase. Its emphasis on design is also clear from the more experimental Lab range, which now has its own dedicated store in London’s Westfield shopping centre. You can follow the discussion on The details of Pal Zileri Sartoriale by entering your email address in the box below. You will then receive an email every time a new comment is added. These will also contain a link to a page where you can stop the alerts, and remove all of your related data from the site. Hi Simon. Excellent blog and interresting update. I’m wondering why I should by these excellent designer brands, though, as the price comes close to that of bespoke. I did in fact by two Corneliani suits last year. They were on sale for one fifth(1/5) of the normal price (I paid £670 instead of the normal price of £3225)! And they are the best suits i have ever owned. But should I buy a suit at full price, I would prefer to spend an additional few hundred euros and go see a tailor. Alas, there is only four left in Denmark, all in Copenhagen. I’m sure that Pal Zileri, Kiton and Brioni are even more expensive than Corneliani and thus justify buying a bespoke suit even more. Do you (or other readers) agree with that line of thought? pal is just amazing, expensive but you get what you pay for! and the design and cloths they use are much more interesting than for example Canali and Corneliani more modern and fresh! If you buy carefully and in Sales Pal Ziliri isn’t that bad. Some of their lines fit me as well as bespoke would, and the great thing you get are thier design ideas. They make up jackets and suits in fabrics and trim that you would never specify as a bespoke customer (unless you are a design genius !) But when you see the finished article – wow. A case in point is the overcoat that Simon referes to. As you can see. I’m a big fan. My only caveat is that their shirts – although in fantastic fabris don’t neccessarily have all the tailot=ring detaisl (spilt yokes etc) that they should, for the price. I recently picked up a Pal Zileri Sartoriale blue lino/silk blazer and it was an excellent buy. The silk lining is so soft it’s like slipping on a delicate silk robe. If you can find a Pal Zileri Sartoriale at a good price, take it! Your suits are very eye catching materials> I do hope to visit some day on an individual shopping. I really love your fabrics.